New research from NASA will enable us to spot incoming asteroids much earlier than before. A collection of images from the WISE spacecraft of the asteroid 2305 King, which is named after Martin Luther King Jr. 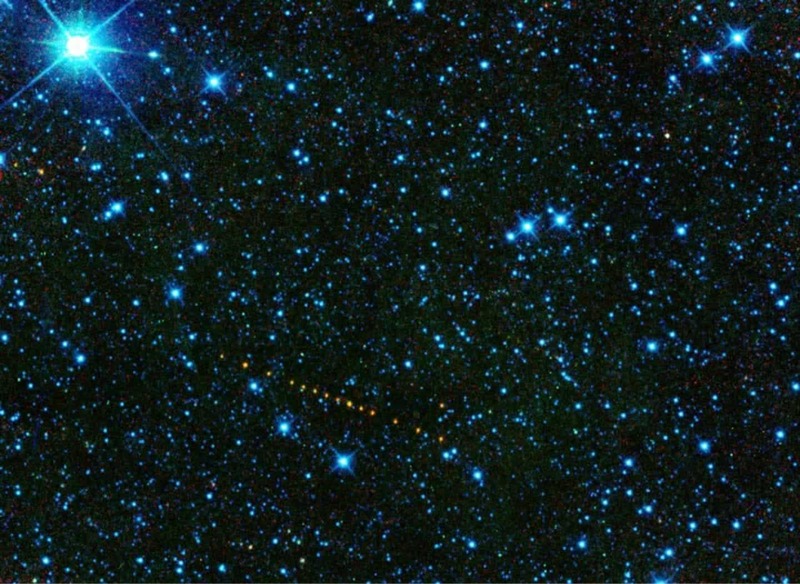 The asteroid appears as a string of orange dots because this is a set of exposures that have been added together to show its motion across the sky. The images were recorded in infrared and translated to colors in the visible spectrum. The Chelyabinsk meteor, although only 17 to 20 meters in diameter, caused extensive damage to people and property when it exploded in Earth’s atmosphere in February 2013. In order to prevent such an event from taking place in the future, NASA researchers have developed a new way to spot incoming asteroids. Mainzer’s colleagues don’t actually plan to see these tiny near-Earth objects (NEOs) as they hurtle toward the planet. It’s simply too much hassle to try and visually spot them. Such bodies are “intrinsically faint,” she explains, as they’re very far away in space and move with great speed. Compounding the issue is that some of these NEOs are “as dark as printer toner” — teasing them out from against the dark background of outer space is thus very difficult. However, the team has a solution, one they will be presenting this week at the American Physical Society April Meeting in Denver. Instead of using visible light, Mainzer’s team plans to use a characteristic signature of NEOs: their heat. Asteroids and comets get heated up by the sun and, thus, glow brightly in infrared (the wavelength corresponding to heat). The team plans to use the Near-Earth Object Wide-field Infrared Survey Explorer (NEOWISE) telescope to scan the skies in the infrared spectrum to spot incoming NEOs. Her work will do more than just alert us to incoming space rocks. Analysis of each NEO’s infrared output can give us a wealth of information regarding their size and make-up, both critical elements when deciding how to defend ourselves from any threatening asteroid. For instance, one strategy available to us is to physically push a NEO away from an Earth-impact trajectory. In order to successfully pull that off, however, we need to know how heavy it is — in other words, we need to know its size and composition. Another key area where this research can be applied is in the remote analysis of asteroid composition, which will help us understand how the solar system formed. “We are proposing to NASA a new telescope, the Near-Earth Object Camera (NEOCam), to do a much more comprehensive job of mapping asteroid locations and measuring their sizes,” she adds. In their presentation, the team will also explain how NASA is collaborating with the global space community to put up a unified defense against NEOs and their impacts. The presentation, “NASA’s Planetary Defense Coordination Office at NASA HQ,” will take place at 10:45 a.m. MT, Tuesday, April 16, in room Governor’s Square 14 of the Sheraton Denver Downtown Hotel. An abstract of the presentation is available here.